An elderly French woman who suffered skull fractures and brain hemorrhaging when riot police stormed a crowd at ‘Yellow Vest’ demonstrations was scolded and discredited by President Macron and the mayor of Nice, according to reports. 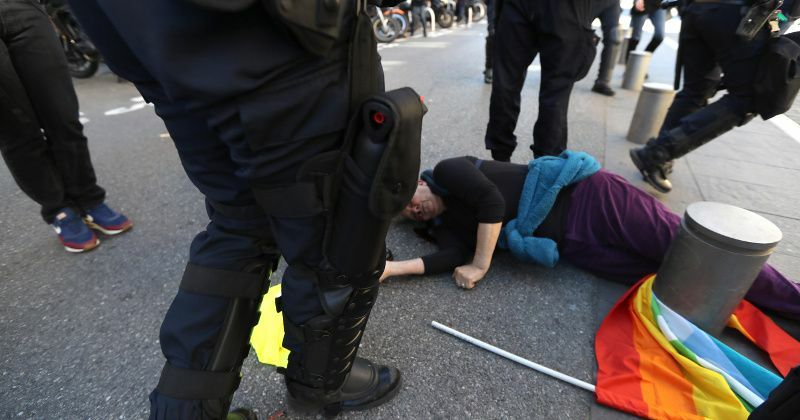 Genevieve Legay, 73, who has been described as an anti-capitalist activist, was reportedly waving a rainbow-colored “flag of peace” when police in riot gear and shields charged into a group of protestors, seeming to knock her violently to the pavement. Video footage of the fray shows Legay lying apparently unconscious on the ground, blood pouring from her face as officers surround her and one checks her vital signs. French television hosts later analyzed “information distortion” about the incident delivered to reporters by Nice mayor Christian Estrosi, who claimed Legay had fallen on her own and only suffered minor injuries. According to Legay’s daughter and follow-up reports, she suffered skull fractures, brain hemorrhaging, and five broken ribs in the melee and is recovering in hospital.